If you've ever regretted having a tattoo and no longer want to live with it, here's some welcome news! Laser tattoo removal is a safe and effective treatment that makes tattoos of all sizes and colours simply fade away. Your tattoo will be assessed and, in the majority of cases, laser tattoo removal will be successful. Tattoos are of two main types: the Indian ink amateur tattoo or the multi-coloured, professional tattoo. Single-colour tattoos usually respond best to laser tattoo removal. Multi-coloured, professional tattoos are much more difficult to eradicate completely. Black, blue and red colours in the tattoo are not unduly difficult to remove, but green, yellow and purple pigment can be particularly troublesome. The laser energy breaks up the Indian ink particles into very tiny fragments. These fragments are taken up by the scavenger cells in the skin (the macrophages), and carried away from the tattoo site, resulting in less tattoo pigment and a gradual disappearance of the tattoo. Indian ink tattoos may respond to as few as 2 tattoo removal treatments, but usually require 6-10 treatments for them to resolve. Occasionally, however, the tattoo will not resolve completely, even with the best laser technology, and a little 'ghosting' of pigment remains. The reason for this resistance to laser treatment is not known, but it may be that the ink is lying too deeply for the laser light to reach. Whilst the Indian ink and red areas in a tattoo may disappear after 6-10 treatments, the other colours may need considerably more tattoo removal treatments. Indeed, sometimes the green pigment will not disappear at all, despite the use of the most advanced laser technology. The scientific reason for this failure to respond is not known, but fortunately it is not common. However, the green pigment in the tattoo may need treating up to 20 times, even with the latest and most modern laser systems. Most patients find laser treatment of tattoos not too uncomfortable and experience a pricking sensation in the skin. If this becomes too severe, either a local anaesthetic cream (EMLA or Ametop) or a local anaesthetic injected into the area may be used. If a local anaesthetic cream is used, it must be applied liberally under an occlusive dressing, 1-2 hours before tattoo removal treatment to produce maximum results. The commonest complication following laser tattoo removal is a reactive increase in skin pigment. This increased pigment only lasts a relatively short time, usually 3 or 4 months, before it disappears spontaneously. This is more likely to happen in people who tan relatively easily. Permanent whitening of the skin has been described following laser treatment of tattoos and this is more common if a very high energy level is used, for instance, with the Ruby laser. However, in most people, whitening of the skin is a short-lived phenomenon, which recovers spontaneously over some weeks. If your tattoo contains iron pigment, immediate pigment darkening sometimes occurs. If this happens, the laser treated area goes black. It is very important therefore, that a test be always carried out first on your tattoo so that this complication of laser treatment, which is fortunately extremely rare, can be predicted. 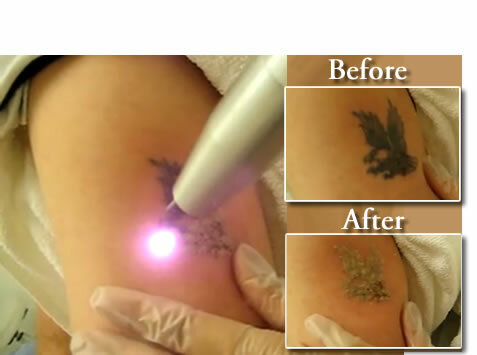 Tattoo removal treatment with certain lasers always produces an immediate whitening of the skin. This is due to the release of microscopic steam bubbles in your skin. This change usually lasts no more than a few minutes before it disappears, and is a sign that the tattoo removal treatment is working satisfactorily. It is unusual to develop any bleeding in the treated area at the power levels used. However, occasionally higher levels may have to be used on certain tattoos, which may result in a little pinpoint bleeding. Usually all this requires, as far as management is concerned, is a simple dry dressing following the procedure. This bleeding does not have any other harmful consequences and does not, for instance, lead to scarring. Once the whitening of the treated area disappears, it is not unusual for the skin to become quite red and appear inflamed; this may last for several hours. Any discomfort is minimal, and may be controlled using standard painkillers, and the area treated with an ice pack. Aloe Vera gel, which may be purchased at the clinic, is beneficial in reducing inflammation caused by the laser tattoo removal treatment. It is rare for the treated area to become infected because the surface of the skin is not usually broken following laser treatment of your tattoo. It is important, however, to make sure that the areas of your tattoo that have been treated are not exposed to strong ultraviolet light or sunshine after the procedure. We recommend the use of SPF30 sun protection cream. What is the cost for the treatment ? Each session not exceeding 30 minutes costs 60 euro and is performed by a medical doctor. Prior to the treatment, the client has to attend for a one time consultation at a charge of 15 euro.